The Loop application cites and addresses the rather stunning statistic that 19.4 Million Americans ages 18-35 “rarely or never” recycle. 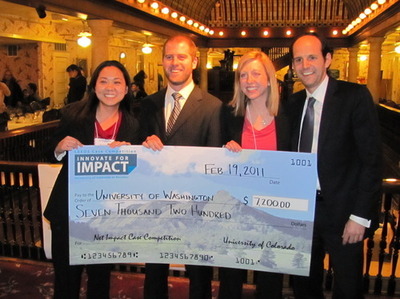 Winning team members Lindsey Reh, Trenten Huntington, Nick Stiritz and Allison Takeuchi have something to think about as they move towards graduation—getting ideas implemented and working that triple pundit bottom line—people, planet and profit. Congratulations to the UofW team and hats off to Foster School of Business and Net Impact for this and their ongoing programs, integrating real-world sustainability issues with education and technology. 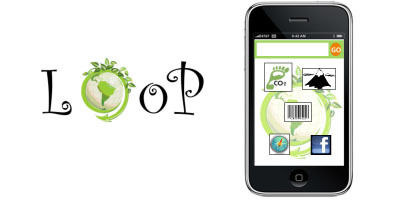 A somewhat similar application was developed entirely independently, less some of the social bells and whistles and the very key level of granular detail needed to change ‘impulse wasters’ — people who recycle at home, and might be influenced to recycle while in cities, if only they know a recycling bin was 200 yards away — this and the social aspect make Loop a unique offering, albeit one which challenges urban planners, waste managers and citizens alike to make change real.